Horace Vernet was the son of the painter Carle Vernet, who was himself the son of the painter Claude Joseph Vernet (1714-1789). He was born at the Louvre, where his parents were housed during the French Revolution. He was a student to F.A. Vincent, but he developed his own, more realistic style. In 1819 he started paiting his large battle scenes. 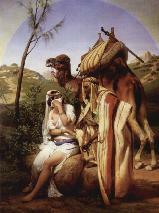 In 1825 Ingres was elected into the Acedémie des Beaux Arts with one vote more than Vernet. In 1834 that same Ingres succeeded Vernet as the president of the Académie de France in Rome. Vernet was a patriot and an admirer of Napoleon and painted several battles, among them that of Jena. In 1820 he made "The Clichy Gate, Te Defense of Paris", showing Marshal Moncey and the Parisians resist the allied forces in 1814. It was refused for the Salon of 1822. In 1826 he painted "Battle of the Bridge of Arcole", showing the young Napoleon leading his men across the bridge. Vernet travelled with the French troops during the Crimean War and also depicted Algerian battles. At a certain moment in time emperor Napoleon III asked him to remove a certain general from a painting, but he refused, stating he was a painter of history and he wouldn't violate the truth. 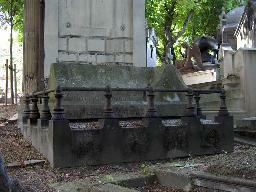 The grave of Horace Vernet at Montmarte Cimetière, Paris.